Amazon.com description: Product Description: The titles in our best-selling Design Brief series are highly praised by graphic design students, educators, and professionals worldwide as invaluable resources. Each beautifully designed, affordable volume offers a concise overview of a design fundamentalthe hows of design. But as most seasoned designers will tell you, a comprehensive education also requires an understanding of the whys of design practice. 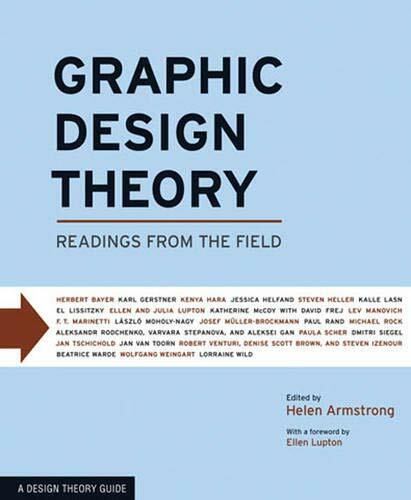 Graphic Design Theory presents groundbreaking, primary texts from the most important historical and contemporary designthinkers. From Aleksandr Rodchenko's "Who We Are: Manifesto of the Constructivist Group" to Kenya Hara's "Computer Technology and Design," this essential volume provides the necessary foundation for contemporary critical vocabulary and thought. Graphic Design Theory is organized in three sections: "Creating the Field" traces the evolution of graphic design over the course of the early 1900s, including influential avant-garde ideas of futurism, constructivism, and the Bauhaus; "Building on Success" covers the mid- to late twentieth century and considers the International Style, modernism, and postmodernism; and "Mapping the Future" opens at the end of the last century and includes current discussions on legibility, social responsibility, and new media. Striking color images illustrate each of the movements discussed and demonstrate the ongoing relationship between theory and practice. A brief commentary prefaces each text, providing a cultural and historical framework through which the work can be evaluated. Authors include such influential designers as Herbert Bayer, Lszl Moholy-Nagy, Karl Gerstner, Katherine McCoy, Michael Rock, Lev Manovich, Ellen Lupton, and Lorraine Wild. Additional features include a timeline, glossary, and bibliography for further reading. A must-have survey for graduate and undergraduate courses in design history, theory, and contemporary issues, Graphic Design Theory invites designers and interested readers of all levels to plunge into the world of design discourse.